The performance Open the Owl brings back to stage the miniature characters from the performance Sovji grad (The Owl Castle), created by Slovenian puppeteer Milan Klemenčič back in 1936. 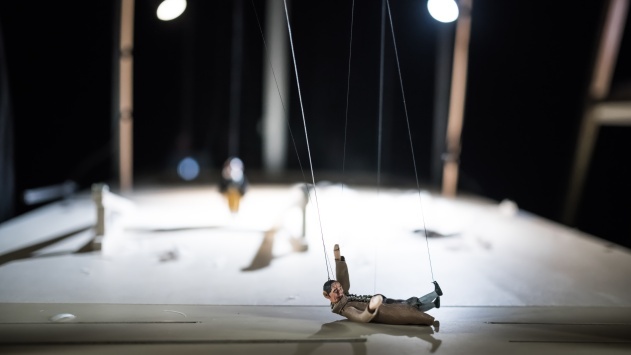 The young and renowned French director Renaud Herbin found his inspiration for this amazing performance in the storage of the Lutkovno gledališče Ljubljana (Ljubljana Puppet Theatre), where he was captivated by the miniature marionettes designed by the famous pioneer of Slovenian puppetry. Using Klemenčič's marionette heritage Herbin thus put the tradition of puppetry art into the context of contemporary performance practices. French novelist Célia Houdart upgraded Franz Pocci's story, tackling such issues as metamorphosis, ruse and deception, in the spirit of a contemporary philosophical tale. Its central character is Kauzenveit – a knight, who has been turned into an owl. He will regain his human form, only when he finds someone willing to pluck out all his feathers in order to fulfil his own wishes. He runs into the cunning Kasperl, who makes a wish to become a minister. The cursed knight is forced to save Kasperl from quite a few complicated situations by sparing his feathers until the last one is plucked out. In this performance the viewer finds him- or herself challenged to reconsider his or her attitude towards stage, illusion and reality. His or her gaze shifts from the Klemenčič's miniature stage beyond the decor, where it is not usually allowed. The space opens up, the viewer’s gaze transforms, and perspectives multiply, following the rhythm of movement of cameras and video projections. The viewer’s relation towards the action unfolding in front of him or her is entirely optional, as he or she is forced to choose his or her own viewing angle, which he or she can change during the performance and thus create his or her own stage interpretation of the story. The only thing the viewer has to do is to take a certain position in the space and trust his or her ability to connect with the seen image or movement. Open the Owl was first presented at the International Puppet Festival in Charleville-Mézières in France – the world's largest »meeting« of puppeteers. Its French world premiere was marked by some fascinating reviews that pointed out funny and inventive direction, precision and concentration of the artists, series of beautifully intertwined ingenious ideas, performance's attractiveness, offering numerous layers of interpretation and last but not least an outstanding animation by Maja Kunšič and Iztok Lužar and their incredibly energetic personification of protagonists. The performance, staged in a Slovenian-French coproduction with the TJP – National Dramatic Centre of Alsace Strasbourg is a first part of a diptych; the second part, entitled as At the Still Point of the Turning World, will premiere at the International LUTKE Festival in autumn 2018. Renaud Herbin puts in the foreground the expressiveness of a myriad of marionettes – in Slovenian version within the classical Klemenčič's miniature and in French version within the vastness of spacious stage. Renaud Herbin is a French puppet artist of the younger generation. He works as a director and animator, intensely focusing on researching puppetry in relation to body, movement, choreography and the suggestiveness of images, objects and visuals. Since 2012, he has been the artistic director of TJP – Centre Dramatique National D’Alsace Strasbourg (France). The last time we could see him in Slovenia was in 2016 when he brought his Milieu to LUTKE 2016. A part of BiTeater project. Le Monde: " Le mélange entre marionnettes à fils reproduites d’après les modèles originaux du Slovène, projections vidéo pour montrer les coulisses du travail des artistes manipulateurs, et réécriture moderne du texte par deux auteurs contemporains, Franz Pocci et Célia Houdart, est une vraie réussite à la fois au niveau esthétique et dramaturgique."